Although marketed as YA, this book has the tone and cadence of a middle-grade novel. The main character is in eighth-grade. 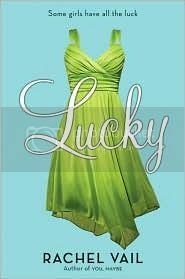 Phoebe Avery has led a charmed life: good looks, good grades, she's friends with the popular set, and her parents make a "comfortable" living that includes designer clothes, their own maid and trips to Europe. She's in the midst of planning a major bash to celebrate her eighth-grade graduation when everything starts crashing down around her ears. Her mother loses her high-powered job, and suddenly, the whole family must economize. I found Phoebe bratty and difficult to like. What sort of eighth-grader demands to purchase a Vera Wang dress? The first clue that all is not right occurs when Phoebe dramatically throws away the family's broken toaster. Her mother angrily fishes it out of the trash, very out of character. Phoebe, of course, has only been imitating her mother who had recently thrown away a slightly imperfect tea kettle. What is strikingly real about the book is Phoebe's excruciating self-conciousness. It's painful to read, because it takes you right back to that feeling of being in middle-school, and terrified of not fitting in. As the youngest of three sisters, Phoebe always feels like she's trying to prove herself. Phoebe feels like she's barely holding onto her spot in her social circle, as her best friend Kirstyn insists on taking their big graduation party to greater and greater excess. Poor Phoebe is so distracted with her family's money worries, she can hardly spare a thought for Lucas, a boy at school that she's been interested in.